A top doctor in the field of male infertility speaks about professional success and medical ethics. Dr. Sherman Silber is a legend in the field of infertility. As a leading international authority on in vitro fertilization and tubal ligation reversal, clients travel from distant lands to his St. Louis clinic, to seek the benefit of his innovative techniques and compassionate heart. His resume is staggering. Silber performed the first testicle and ovary transplants in the U.S. He invented the microsurgical vasectomy reversal technique and, with co-workers in Brussels, developed techniques of sperm retrieval and injection (ICSI), and the more recent testicular sperm extraction (TESE) which allows him to serve men with a zero sperm count. Silber’s many TV appearances include Oprah, Nightline, Good Morning America, and the Today Show. 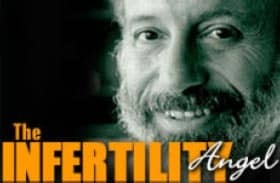 He is the author of the best-selling “How to Get Pregnant,” and “How to Get Pregnant with the New Technology.” He has published more than 200 scientific papers and 50 teaching videos, and hosts the popular website www.infertile.com. Silber says that he “accidentally” came to specialize in infertility, led by a series of unforeseen circumstances. While we accept his explanation, we are reminded of the Talmudic dictum: “In the place where there is no man, strive to be a man.” Dr. Silber never saw a need he didn’t try to fill. Devoted doctor, husband, father, and kids’ soccer coach, Dr. Sherman Silber keeps moving and accomplishing. Aish.com tried to keep up with Dr. Silber in his office in St. Louis. I grew up on the south side of Chicago in a bad neighborhood, the kind everybody wants to get out of. There was a lot of arguing and fighting; it was very dysfunctional. Believe it or not, what got me through it was Hebrew school. I would take a public bus every day to our synagogue. It was a lot of fun, and gave me a positive outlook on life amidst so much negativity. How did you come to the field of medicine? I knew I was going to be a doctor because my mother and father told me when I was five years old that it was a good idea. As I got older, I accepted the validity of their viewpoint. You get to help people. You get out of the bad neighborhood. You have financial security. And it’s important, exciting work. And now you’re a medical pioneer. What guided you in the direction of fertility work? To think we chart our own course is a mistake. It’s very egotistical. God is definitely directing everybody in the way they’re going. When I graduated medical school, I went into the Public Health Service in lieu of the military, and found myself in Alaska. We had no urologist. So I developed an interest in urology, which led to kidney research on rats. I then went to work in Australia where we were operating on rat arteries that were one-half millimeter in size and invisible to the naked eye. Of course, she said I was wrong, and told me to go to the laboratory and practice that right away. This was three years before in vitro fertilization and nobody knew anything about embryology. A year and half later, vasectomy reversal was on the front page of the New York Times and I had become very famous. There are upwards of one million vasectomies performed in America each year. What percentage wants reversals? About 1-2 percent, which means that every year about 10,000 Americans have a vasectomy reversal. Before I got into this field 25 years ago, there was an occasional success, maybe one percent. With the techniques we use today, 90 percent are successful in restoring fertility, and the remaining 10 percent can rely on sperm retrieval techniques where the wife can become pregnant through IVF. Why do men get reversals? What’s the sociology behind this? I think western society is in many ways self-centered. Men initially get the vasectomy so they (and their wives) can have unencumbered freedom to enjoy a materialistic lifestyle without being hampered by more children. And this often leads to unhappiness. Because the only real happiness is when you’re outside of yourself and giving to others. Human beings will shrivel away without meaning in their life. I’ve found that the people coming to me feel that to a certain extent they’ve lost the ability to give, and they’re looking to tap back into that. I know people from every walk of life, and the day before I’m going to operate on their testicles they usually tell me everything. And the people who have amassed a lot of wealth and a lot of fame but who haven’t had real meaning in life do not feel successful. They’re tortured. They can’t sleep at night. That’s such an emotionally charged word. I think it involves character. You have to achieve something — something good, beneficial and valuable to the world — or you’ve missed the boat. It could be writing a book that is enjoyed by others, or being a dispenser of wisdom, or devoted to medical care. “Doing good for others” can get very muddy, because a person needs to know how much of this is looking for applause, kudos, recognition. That aspect of success and accomplishment has a very brief half-life. It’s never satisfying. As I’ve gotten older, I’ve struggled to figure out how much of my work is the empty pursuit of recognition, and how much of it is just this innate desire to help and do a good job. Because the true mark of success doesn’t require recognition from others. You have to know yourself that you’ve done as good a job as you can do. I guess the reward of integrity is you get to live with yourself! That depends how you define it. I look at spirituality as connecting to the world outside of yourself and keeping your mental eyes wide open to your universe. If every little event in your life, no matter how tiny, has significance, then in order to gain the most from life you have to be functioning at an elevated level of consciousness all the time. For me, that’s spirituality and that’s connecting with God. Do you find spiritual elements in your work? Well, the first command that God gave to human beings is “Be fruitful and multiply.” So I’m very lucky in that my infertility work is intrinsically meaningful. Beyond that, the “pursuit of meaning” is the easiest thing to neglect, because there’s always another patient to see or another paper to write. But if you don’t take the time to expand and enrich yourself by learning the meaning of it all, you may be missing out on a greater dimension. And in the long run, your other work will suffer. So I want to get more balance, and it’s a feeling that’s been growing steadily over the years. What have you done to achieve this? How does this differ from classical philosophy? You could study a lot of philosophy — Plato, Aristotle, Kant, Spinoza, Descartes — and it’s fascinating intellectual stimulation. But it’s all tautology, a series of theoretical assumptions, and I’ve found that most people who study philosophy end up disappointed. Whereas with Talmud, the whole point is practical application. How do I take this knowledge and translate it into becoming a better father, a better husband, a better human being — and a better scientist.